This is quite possibly one of the easiest ways to provide extra funds to our school's PTA. Our programs rely on your donations as well as your corporate matching! Many local companies match donations to non-profit organizations so you can get your Annual Beagle Contribution donations matched. 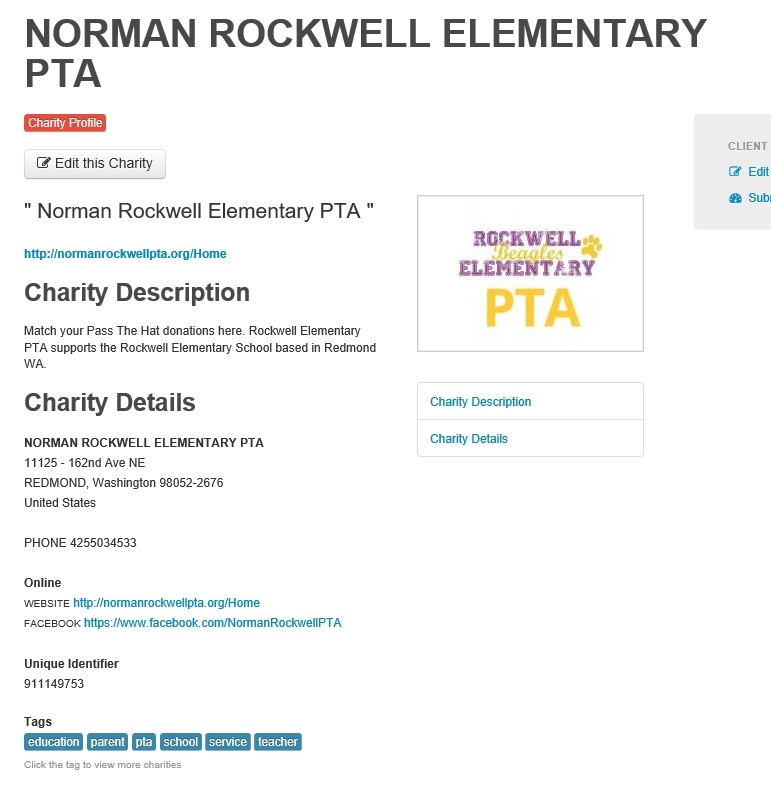 Please check with your employer to find out if the money you donate to the Norman Rockwell Elementary PTA can be matched. Here are a few companies we know of with matching programs, but if your company is not listed and you know know they have a matching program, please let us know! This list may have changed so be sure to check with your company. If you volunteered time for the PTA, you can also request funds by clicking on the "Volunteer Manager" button on Microsoft's corporate intranet. When you donate 10 volunteer hours, you can submit a volunteer matching gift request for what is eligible under the Microsoft Matching Program Guidelines. Please submit your matching gift request online through your internal website Total Access or call 1-866-473-2016. If you volunteered your time, you can also request funds. For every 25 hours of volunteer service you give to an approved organization, Boeing will donate $250 to the organization. (Volunteer match is currently not available for retirees or non-U.S. employees). Please submit your matching gift request online through your corporate intranet or call 866-243-6855. If you volunteered time for Rockwell Elementary PTA, you can also request funds via the Dollars for Doers program. Do you have a Corporate Matching program? Many companies match charitable donations made by employees. Many companies also pay our school for your volunteer hours, so if you volunteer regularly, please check with your HR department.